Astrid Cloverleaf: a knitting persona blog: bag me, baby! My bag was delivered last Monday but I didn't make it to the office to pick it up until Friday afternoon! 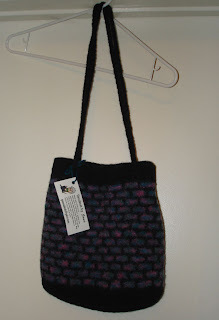 Jane sent me a gorgeous bag.. black with purple and blue jeweltones! I haven't used it yet as I haven't left my house, but it's all packed for work on Monday! !